Submitted by lynn on Wednesday, September 26, 2018 - 8:56pm. 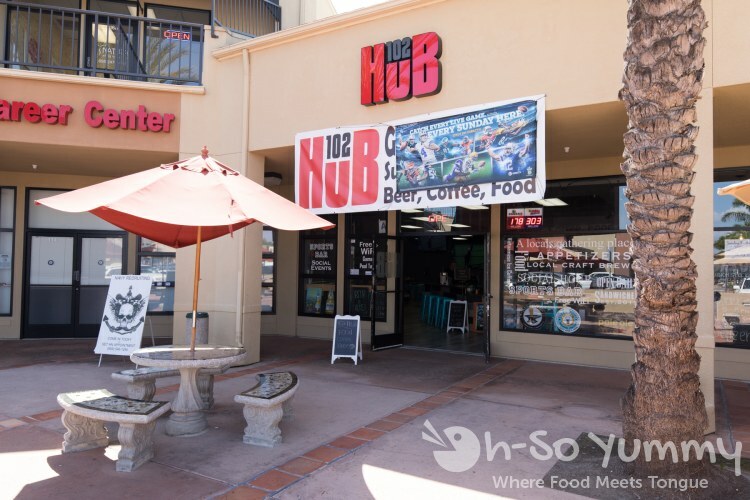 102 Hub opened about three months ago in the Plaza Sorrento Shopping Center (off Mira Mesa Blvd and Camino Santa Fe). Dennis and I were feeling incredibly hungry so we popped in to explore this local spot. We're slowly making our way to new places around the neighborhood including the recent San Diego Snowy Village and Gen Korean BBQ visits. Walking in, we were surprised at how roomy the space was. To the left were multiple bar height tables, some bar seating on the opposite side, and a loungy area with couches. Entertainment included a pool table, social games scattered on various tables, and several televisions playing sports mounted throughout. 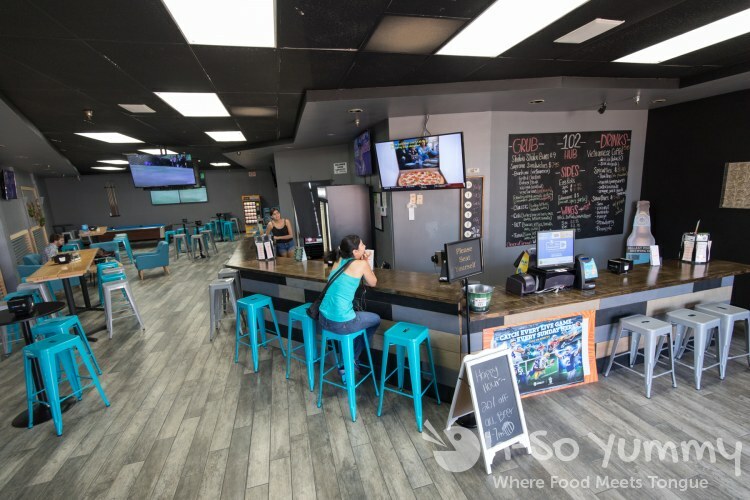 A long chat with the friendly owner Jade revealed that the goal was a great beer and sports bar, which was somewhat lacking in the Mira Mesa area. We ordered our food, then paid at the counter. Dennis's mom had dropped off a Buy 1 Get 1 Free Magazine recently so we were able to use a $5 off $20 coupon when paying. Other useful coupons included $2 off $10 which I think I'll use for a future lunch. Two food items came out within a few minutes while the last Cali sandwich took longer. The sandwich comes deconstructed with the pickled carrots and jalapenos on the side. Customize to your liking! 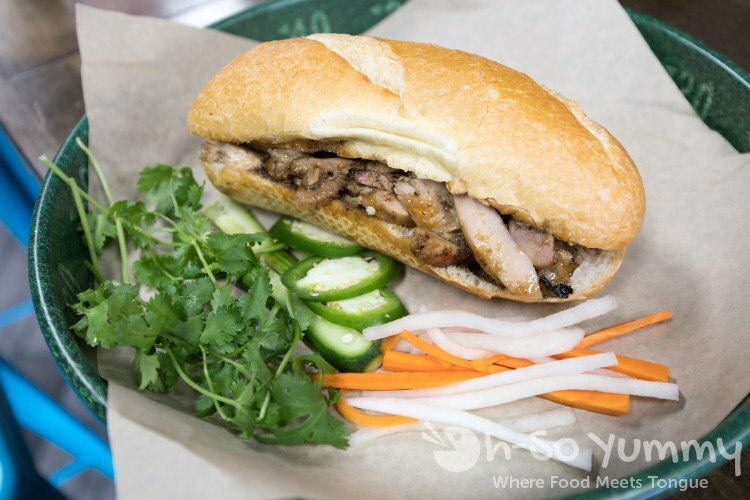 One trait I enjoy for a banh mi sandwich is the bread, which should be fluffy on the inside and perfectly toasty on the outside. This one totally fit the bill, wrapping the generous serving of moist chicken flavored with some oyster sauce. The cuts were stir-fry size to hold the flavor instead of the shredded type at other places so we liked this change. The price is double over a traditional banh mi shop but they do give you twice the amount of meat as well. We no longer have to eat 1.5 - 2 traditional sandwiches to get our fill! There are only four banh mi options available and the most Vietnamese one would be the meatball version. I'm saving the fusion bulgogi for my next visit. This solid stackup seemed to have much care put into its beautiful build. This sandwich contained thicker slices of the turkey and ham that held together well for each bite. Avocado kept it creamy between the layers. Our pick of bread was sourdough though there's also white or wheat as options. A side of regular potato chips accompanied the sandwich to make it a full meal. We were quite pleased with how tasty this sandwich was! 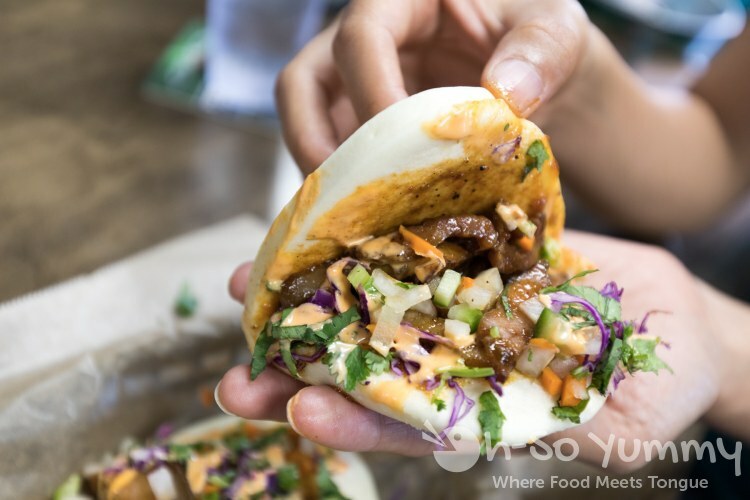 Lately, we've only had baos at Japanese restaurants like Wokou Ramen & Yakitori and Tajima East Village. Now here was a fusion spot to change it up! The baos came in a set of three and the buns were a bit on the thicker side. You had to put a little more muscle into your bite but the buns did their job of corralling all the mini-cut contents! Once again, there's a bit of that oyster sauce flavor to these tender pork pieces and a little crunch from the veggies. Overall these are yummy but due to its messiness, I'd rather get a little less sauce. Here's their current menu. Jade used to run a successful coffee shop in another part of town and brought the Vietnamese Coffee recipe over to the new business. 102 Hub currently opens at 7am so early risers can grab their ca phe sua da (iced coffee with milk) or ca phe den da (iced coffee, black) before work. There is also smoothies and specialty drinks to choose from. We noticed they have lotto-pick displays, a lotto scanner, and even a lotto ticket buying machine in the back. I believe they are holding (or will be soon holding) poker game nights. The instagram shows some involvement with car meetups so that's another community that frequents this shop. 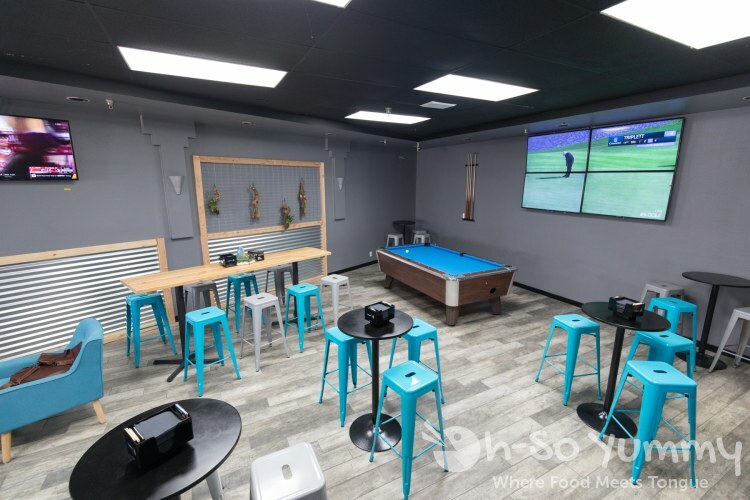 The multiple tvs allow for different sports to be played simultaneously (all with their own speakers) so even sports lovers can get a little bit of the action. With its beer license, this really could be the new spot to hang out and have a drink. It's possible the hours will be shifted to later evenings if all goes well. 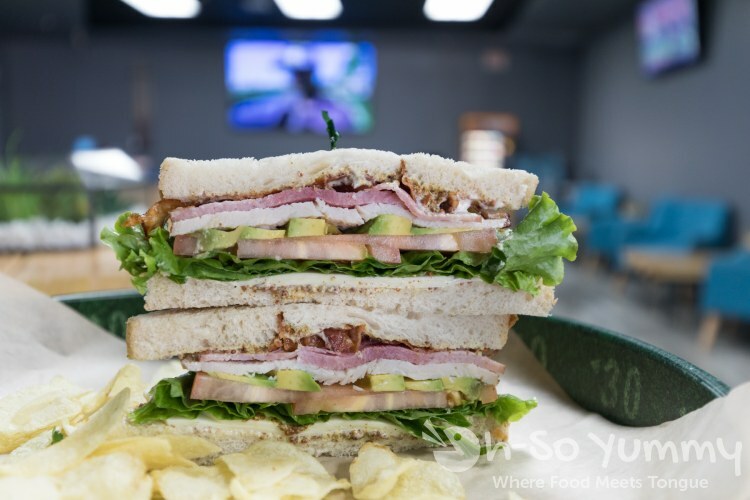 We plan to keep an eye on this casual spot as well as try a few other sandwiches. Ohh! A new spot! I might come here for some of those bao buns. I dunno about an $8 banh mi though. But maybe if it's loaded with meats. You always find the yummiest looking food! Those tacos look especially delicious. asian tacos! yea they were decent! Those sandwiches look amazing. Love the cool decor the pops of color are great! it IS colorful huh? i don't visit that plaza too often but there are a few other spots i have yet to visit! What a fun little place to eat. The menu looks good too! small but simple menu. it's definitely a sports bar feel though, less restaurant. I've heard of this place! I need to find coupons now. Is this the same plaza as Yoshi Sushi (if it's still there). 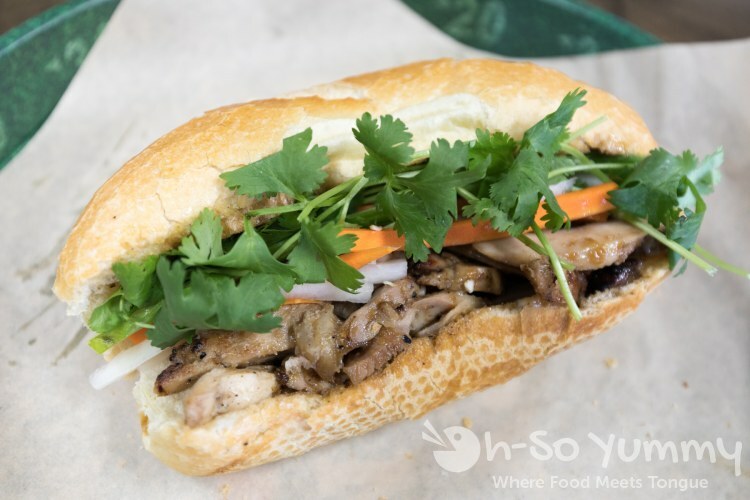 I wonder i they bake their banh mi breads in house. 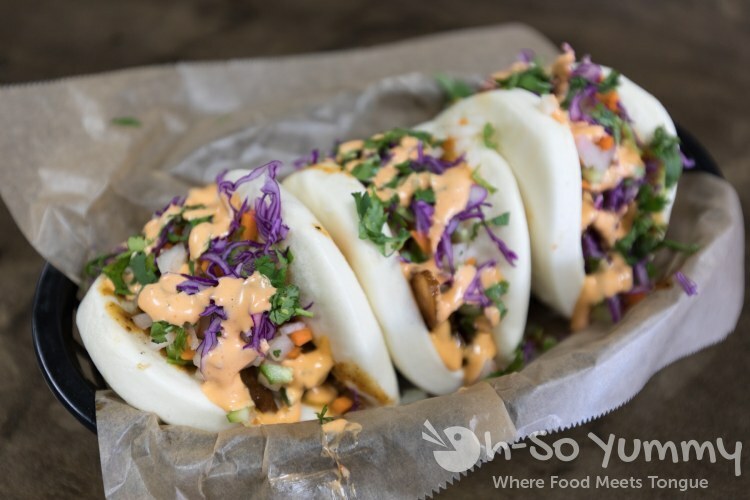 The baos look substantial. I'm curious about their wings too. they said their coupon would be in the coupon mailers but i haven't seen it since this visit. they now have daily specials including 75 cent wings on thursday and half off sandwiches on wednesday if you wanna check out their lunch specials. Interesting menu. 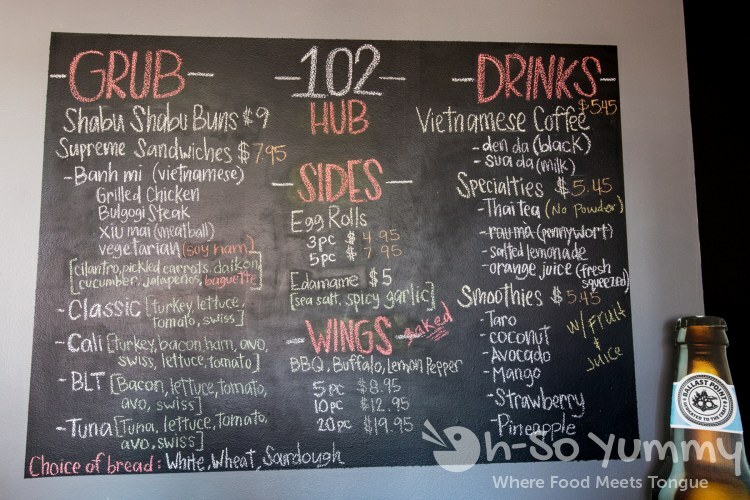 Sandwiches, wings, and egg rolls. I think I'd go for wings and egg rolls. saw they have 75 cent wings on thursday for lunch. i wanna try those when it is on special!